A short post today all about a particular item of clothing. Yes, lately I've been fully embracing my DVF scarf! I don't know whether I am a million years behind everyone else but I have been loving 'House of DVF', a real-life documentary/competition style programme where contestants are whittled down to find a winner who would become the brand ambassador for DVF. I won't tell you who the winner was in case I spoil it for you (find it on On Demand with Sky Plus!) but I absolutely loved the show, and the fashion is absolutely unbelievable! Diane von Furstenberg is an absolute icon; she has a way of making women feel empowered through what they wear and her iconic wrap dresses in particular are cut beautifully and are so flattering. A DVF wrap dress is definitely an added addition to my high-fashion wishlist, but for now I tried to use my own wardrobe to create a similar look to match the DVF style. Seeking inspiration from my beloved My Little Box DVF scarf, I threw a couple of looks together...see what you think! Okay, starting with this Primark dress (old!) 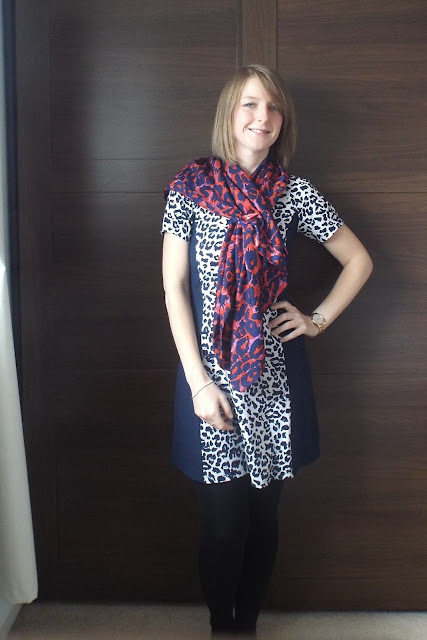 which I think has a DVF style print and quite a similar print to the scarf, I thought a pattern clash and a pop of colour would really bring this outfit to life! I added my little DVF lips pin too, to pin the scarf and finish off the look. Now I know in this shot, you can't really see my outfit, but I was having a casual day. Combining the scarf with my Levi's sweater and jeans and a pair of girlie red pumps, gave my boyish look a real feminine feel. I added my little Eiffel Tower necklace too, which was cheap as chips from Avon, but I'm rarely seen without it as it reminds me of Paris, my happy place! My big bro and I! ...with the scarf added for a pop of colour. I love a vintage look and think the scarf helped to complete the outfit beautifully! Which are your favourite DVF pieces? Loved the colors of the scarf, it makes your outfit pop!